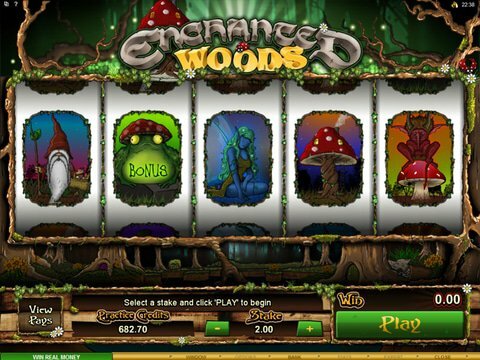 If you are a Canadian gambler who is looking for some whimsical slots for fun, then the Enchanted Woods slot machine from Microgaming is a great option. Across five reels, you'll watch a fairy tale play out in a beautiful forest filled with creatures. You can review it right here on this page with no download and no registration thanks to the Enchanted Woods free play slot demo available on this page. It's accessible from most PCs, Macs and mobile devices, too. The graphics here are enough to keep you coming back for more, and the betting range is wide enough to satisfy anyone at between a penny and $100 in value. There are mushrooms, wizards, leprechauns and more to make you smile, and the features are quite fun, too. Each spin is actually two in one, making this title fairly unique. The first spin shows you the symbols, and you get to click the symbols you want to hold up to a maximum of five. Then, the reels will spin again while the icons you chose to hold will remain in place. All you have to do to win is get three matching symbols, and you win! There's a wild in the form of the purple Fairy, and there's also the Frog that will trigger the unique "Pick-Me" bonus round. If you enjoy reels that are set in the trees but you're interested in something a little more grown-up in which you can invest your money, then Gonzo's Quest from Net Entertainment is a great choice. This one is based on the adventures of an explorer who finds himself searching for treasure in the jungle. The top jackpot is $62,500, and there are features like avalanche wins, tons of wilds, and even a set of "free falls" with multipliers climbing as high as 15x.